Unlimited Prints or Minimum Page Count? The term “unlimited” may give the appearance of power and control, but the price that comes with it may not be worth it. You may be paying much more than you need to because you have been convinced that unlimited prints gives you the ability to complete any job you need to do, without overage charges. But what many people don’t consider is that they are paying a lot of extra money for pages that they never even use. 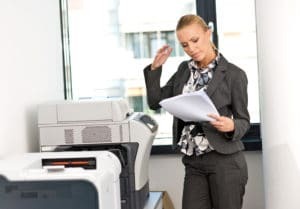 Copier sales can be tricky, but once you break down your real usage per month, our reps at Albuquerque Copier can help bring down your costs by thousands every month. While you may have been convinced by others that one simple monthly price is easier and more efficient, buying less than you need and paying a small overage charge will, more often than not, save you and your company thousands in the long run. How many pages am I consistently printing per month? Is the sales rep trying to actually help me, or just make money for themselves? In many cases unlimited prints may look simple, but it can hurt your company financially. Breaking down the costs can show where your contract may be hurting you. Our reps at Albuquerque Copier can help you find the best price point for your company and take your business to the next level.